IF YOU WANT BLOOD...YOU GOT IT! Yes, we hunt and kill stuff. That is what this site is about, and we do not apoligize for it, never have and never will, so dont waste your time pounding your keyboard silly with hate mail. 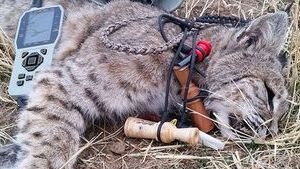 Varmints Inc. is the brand name of a small , specialty line of hand crafted game calls, made here in Central California. All of my calls are hand built, one at a time,here in my small shop at home. I use quality materials, and build most of my own parts from scratch. The few parts I do source elsewhere, are hand fitted and hand tuned. My goal is to build solid quality hunting calls, as well as helping to keep the call making/calling tradition alive. My first priority for my calls is making sure they sound good and are easy to use (although this can differ from person to person and is obviously subjective) . As for building them, the shapes and styles I use are simple and basic...nothing fancy or crazy, but I do try to make them look good and very usable/comfortable in the hand. I use good materials, and I try to make sure they are rugged and reliable, as they are intended to be hunted with. I like to build stuff that will last a long while. Fancy looks take a backseat to build quality. Having said that...stuff happens. If you have a problem with one of my calls , I will try my best to take care of it to our mutual satisfaction. Also...If you are looking for a shelf queen, or something shiny that you believe may be a "collectible" call...well..there are many call makers out there that are extremley talented and build ultra fancy calls out of very high end materials...I am not, and do not....I will leave that to them, but I will certainly point you in their direction if that is something you are looking for. I have no problem with that whatsoever. Keeping the call making tradition alive is important to me, and Im happy to help. Just holler.